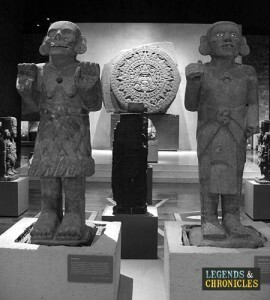 The Aztec religion revolved around various gods which they adopted into their lives over the course of time. Each human aspect of life for the Aztecs was guided by a patron god and therefore there are literally thousands of gods. The daily activities and rituals of the Aztec people were also guided by these gods, and to create balance of power, the gods were offered human sacrifices all throughout a special calendar that marked festivities for each of them. The Aztec people were tied to their gods through their lives and constantly showed the strength of belief they had in these gods. The Aztecs believed in heaven and hell, and they worshipped the sun, the moon and the stars. The beginning of the world in Aztec lore had its origin told through a tale called the Legend of the Suns. The Aztec Empire was at the the 5th cycle of creation and destruction, and each world called suns was destroyed and revived again in a 52 year cycle. The main Aztec deity was the creator god Ometeotl, who was both male and female and therefore he was able to create the other gods. Ometeotl created the other four main Aztec gods, first was god of the North, Xipe Totec, second was god of the South, Huizilopochtli, third was god of the East, Quetzalcoatl and fourth was god of the West, Tezcatlipoca. 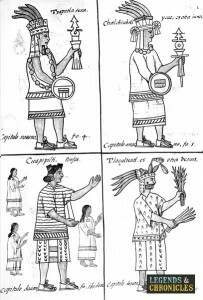 Together these four Aztec gods were known as the four Tezcatlipocas, and the directions pointed to their home as being the centre of the universe in the eyes of the Aztec people. The four Aztec gods, the Tezcatlipocas created everything in the world including the sea monster Cipatli who was part crocodile and part fish. The gods later had to destroy Cipatli who was selfishly devouring everything they had created, and by tearing this monster apart in all directions, the universe was created, born from the destruction of Cipatli. Legend has it that 13 heavens were created from her head, the world was in the body or the middle and at its tail was Mictlan, which was the Aztec underworld comprised of nine different regions. This Aztec legend of their gods and their universe is represented by their Sun Stone Calendar referred to by the Spanish as La Piedra del Sol, and to finally complete creation, the gods had to create light for the Aztecs, hence the creation of a sun god through sacrifice. The Aztecs as we mentioned, believed in a 52 year cycle for each Sun or World before its destruction, and this focused around the five suns. The first Sun was destroyed by floods and everyone turned into fish. The second Sun was eliminated by jaguars. The third Sun was ended by a rain of fire. The fourth Sun was wiped out by a storm and people transformed into monkeys. The fifth Sun was believed to be the cycle of existence of the Aztecs. In order to find a ruler of the fifth sun, a god had to be destroyed to become the light or the sun of the world. The god was to throw himself into a fire as a sacrifice and initially Tecciztecatl volunteered but chickened out. In his place the brave Nanauatl jumped instead. Nanauatl because he was brave became the sun and the coward one, Tecciztecatl shone less bright because of his shame and became the moon. The Aztecs honoured the god’s sacrifice to become the light and believed they were in debt to this god. There the Aztecs sacrificed humans in order to prevent the destruction of this world through earthquakes and disasters of the like. A goddess called Coatlicue gave birth to Huitzilopochtli from a feather ball. His siblings, the Coyolxauhqui and the stars were jealous and ashamed of this so they plotted to kill their mother. Huitzilopochtli fought for his mother and defeated them. He beheaded Coyolxauhqui and threw them in the sky to become the moon. Because of this Huitzilopochitli is considered the sun god, and while not belonging to the 4 directions he is also the god of war. Huitzilopochitli was also known as the patron of the Aztec capital, Tenochtitlan. A long time ago the Aztecs were nomads and kept wandering and waiting for sign from Huitzilopochtli. He supposedly guided the Aztecs to this swampy land in the middle of Lake Texcoc which is at the present day known as Mexico City. The Aztecs searched and searched for a place to settle and asked for a sign. When they saw a bird eating a snake while sitting on a cactus, they believed that the god led them to their home. They built a temple called Templo Mayor in a great city which they believed to be the Center of the Universe or the Axis Mundi as the Aztecs described it. Tezcatlipoca rules the night sky and is thought to bring misfortune. Strangely enough Tezcatlipoca’s symbol is the the Jaguar which and is also associated with war and royalty, and the name taken by some of the most fearsome Aztec warriors, the Jaguar warriors. Quetzalcoatl is the god of agriculture which is the main occupation of the Aztecs. He is the feathered serpent who was the second sun, and of course due to the farming nature of the Aztec people Quetzalcoatl is a very important god. The Aztec peoples belief in their gods was second to none, their passion was overwhelming and they went to extremes to appease their gods. The mighty temples that the Aztecs built, and their ritual calendar that the Aztecs followed religiously was testament to this.